You’ve spent all this time making sure that your property looks beautiful. Your trees and your vegetation are all nicely in place and properly maintained. You’ve even recently painted the outside of your house and installed new lighting. But nature doesn’t care. In a blink of an eye, one bad storm can ruin all of your hard work and the money that you’ve spent on your property. One of the main ways to prevent damage to your trees and, naturally, to your property, is to make sure that your trees are structurally secure. In order to accomplish this, flexible steel cable wires and bolts can be placed and installed on your tree. They can also be used to secure any branches or limbs of the tree that seem as if they could be damaged easily by a strong gust of wind. It will also make the trees better able to handle the poundage of heavy rain. These cables and bolts can be installed in a way in which they aren’t visible so that they won’t detract from your property. Trust us, you won’t regret having these installed. The windows and other parts of your home that are close to the trees will be protected by having any close tree limbs or branches removed. Having your trees pruned will not only preserve your property in the case of a bad storm, but it also preserves the trees themselves. The stronger the root system of your trees, the greater the chance that they will be fine after a storm. That’s because a strong root system means that your trees will have a nice flow of nutrients into them, which will help to keep them firmly secured in the ground. You can help to ensure that your trees’s roots are healthy by fertilizing them, watering them regularly, and making sure that they’re mulched. If there’s any weeds around your trees, have them removed as well. 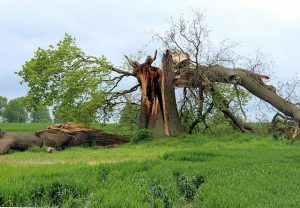 Lewis Tree Service has close to 30 years of experience in helping residents in the Santa Cruz area storm-proof their properties. Contact us today for a free quote and to have one of our ISA certified arborists sent to examine your property!